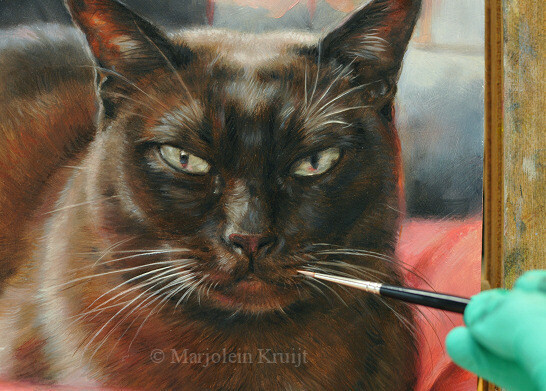 When you order a petportrait, Marjolein will put a lot of effort in ‘the first base’. First she discusses thoroughly with you what kind of feeling the painting has to capture and which part of the pets character needs to be accentuated. After making a choice in technique and size, the commission will be confirmed on paper. A 30% payment in advance is appreciated. Then Marjolein designs a layout for the portrait, sometimes multiple ones. When you agree on a basic design, she will continue with the actual portrait. This way you will be garanteed satisfied with it. Capturing the animals personal character is the most important thing in portraiture. Marjolein pictures a specific ‘timeless moment’ where you, as the pets owner, feel the deepest connection with your pet. That is not only seen in the animals glance or in realistic painted eyes. This goes beyond photographs and technique. The ‘soul’ is captured in finetuning composition, the way the animal bends his head, the direction in which the animal looks, colors, background, lighting and experience. Added a character description of the pet, which helps Marjolein to actually feel a connection. She adjusts all elements in such a way that the portrait seems to come alive. Marjoleins quality in portraiture is her twenty year experience in adjusting and adding elements to enhance a portrait. Think about the posture of the animals ears, glance of the eyes, lighting, backgrounds and combining physical postures. Even disturbing flashes (when working from existing photo’s) in eyes and fur can be changed into normal lighting. Mentioning these possibilities describes how much experience Marjolein has, and that she uses photography as a starting point, not as a blind-copy way of artmaking. Therefor it’s important for her to see as much reference materials of the animal. Sometimes even video can add to capturing the right personal details. 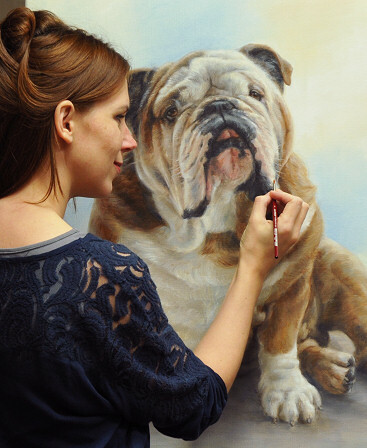 Dutch customers usually visit her studio, so she can get acquainted with the pets. (unless it’s a portrait in memory of). The animals character is prior: choosing a correct ‘mood’ decides which colors, composition, posture of the animal Marjolein will use for her portraits. Adding on top Marjoleins intuition, developed by her experience in animal communication adding a little bit of ‘magic’ to each painting. This lifts a painted portrait above a photograph on the wall.